Snowboarder Pierre Vaultier's dream comes true as he builts the ultimate snowboarding pump track in the French ski resort Serre Chevalier Briançon. 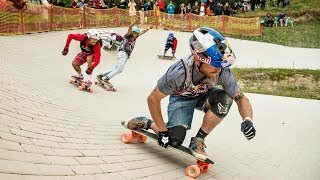 Last July, the rider of Serre Chevalier decided to embark on a new challenge: build the pump track of his dreams, and invent the boardercross 2.0. The track consists of a 250m long line composed of fifteen modules with a tower that rises to 5.50m. Now that's a pump track! Pierre Vaultier is a two-time Snowboard Cross World Cup winner and Olympic champion.